I was more than slightly nonplussed when I clicked on the link that took me to After the deluge: 29 remarkable works inspired by Hurricane Katrina and found a complete absence of James Lee Burke's The Tin Roof Blow Down, a novel that burned with an almost incandescent rage (at least that's the way I recall my reaction when I read it back in the pre-blog era). Yes, there were most of the other obvious inclusions (Elvis Costello & Allen Toussaint's The River In Reverse, Dr John's City That Care Forgot and the Treme TV series) scattered among the rap, hip hop and other musical items, and I've added historian Douglas Brinkley's The Great Deluge, Dave Eggers' Zeitoun and a couple of titles by Tom Piazza (Devil Sent the Rain: Music and Writing in Desperate America, City of Refuge and Why New Orleans Matters) to the chase these up in the Kindle Store list. 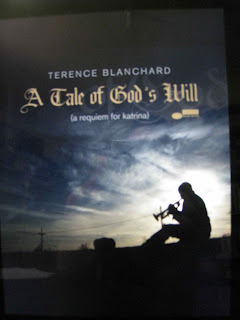 At around $30 for the DVD I'm not quite so sure about the Spike Lee documentary When The Levees Broke (2006) and it looks like the sequel If God Is Willing And The Creek Don’t Rise (2010) hasn't made it onto DVD but a reference to Terence Blanchard's A Tale of God's Will (A Requiem for Katrina), based around the soundtrack compositions Blanchard contributed to When The Levee Broke had me heading over to iTunes. While there was something familiar about the name, a quick check in my iTunes library revealed a total lack of Terence, and resulted in a bit of checking around the ridges. He gets a brief name check on p. 209 of Samuel Charters New Orleans: Playing a Jazz Chorus, citing him as one of the roster of talented young trumpet players who have had to leave New Orleans to make a living with their music and acknowledging his work with Spike Lee on film scores along with his own solo career. Location 828 has an eight-year-old Blanchard who'd fooled around on piano before he had an epiphany during a visit to his elementary school and subsequently focused on the trumpet, shortly before he met Wynton Marsalis and attended the New Orleans Centre for the Creative Arts, developing his molasses-smooth tone and expanding his New Orleans roots with a fascination for other types of music. That process took him to New York and a stint with the Lionel Hampton Orchestra and Art Blakey's Jazz Messengers before forming his own sextet and heading off into film and television score work, which probably explains why there's nothing of his work in environments like the City of Dreams or Doctors, Professors, Kings & Queens box sets. I took a brief glance through the booklets that accompanied those two collections, and while I might have missed a credit in there somewhere, they're not exactly environments where you'd expect to find exponents of modern jazz or hard bop, are they? All of which explains why I wasn't previously aware of the player who has been kept busy writing the scores for every Spike Lee movie since 1991 (overall he has more than forty film score credits) and whose current position as Artistic Director at the Thelonious Monk Institute of Jazz had a lot to do with the post-Katrina relocation of the Institute from the University of Southern California to Loyola University New Orleans, a move that stemmed from an expressed desire to help jazz and New Orleans flourish once again. From the opening Ghosts Of Congo Square, an Afro-Cuban celebration of the only place Crescent City slaves were allowed to gather and openly celebrate their African roots, titles like Levees, Wading Through, In Time of Need and Ghost of 1927 provide a fair indication of the overall mood explored here, with a fair degree of retrospectivity thrown in among the melancholy and yearning for renewal and revival after tragedy. It’s a case of the aftermath rather than the storm itself. Based on A Tale of God's Will I'll be keeping an eye out for future releases, and will probably be heading back into the discography. There's always going to be room in the music library for more along the lines of this collection of quietly melancholic pieces, but the problem has always been finding them. Now, at least, I have an idea of where to start looking.